After watching the episodes a few times I suppose that most will notice that Steed sometimes had a stunt double (Rocky Taylor, Paul Weston etc.). I've been wondering if anybody noticed this on original transmission but I don't expect the answer to be yes. So, has anyone that you've introduced the show to noticed this on viewing an episode for the first time? The cutting between the two actors is done pretty well, so they'd have to be very observant! As I watched the episodes the first time, I haven't notices the doubles either. Well, but after some time and re-watching them, I noticed that, too. So, as you said: They were very clever with cutting the scenes. I think the larger size of TV screen we have today can highlight the use of doubles and stunt performers too. Yeah, and in the re-matered material it also any more visible. I can;t speak for the original show but "The New Avengers" was infamous for it - that's why the Benny Hill skit lampoons obvious stunt doubles so unrelentingly. I always thought TNA's stunt double use was pretty well done, actually. They didn't have to use many to begin with, since Gareth and Joanna did most of their own stunts, but the few times they do, they always seem a better fit for the actors than they did on the original show. I've always thought Steed's doubles were particularly, almost painfully, obvious, especially in season 5, even when I first started watching the show, even though it was a fairly small screen and I wasn't looking for them. It's the different hairstyle that does it in--Steed goes from having Patrick's neatly-gelled waves to a floppy 'do that bounces around a lot in the fight/driving scenes. And the profile often doesn't work. For Emma and Tara, it's the figure that tips me off. I have to say that's the first I've heard that. Quite the reverse in fact. The only noticable Purdey double was the pirouette in The Eagles Nest and a tap scene in Three Handed Game. Gambit - I never noticed a thing possibly because he did all his stunts. We've often discussed the lengths both actors went to - drinking a glass of Champagne from a rope ladder dangling off a helicopter for intstance - that wouldn't be allowed today. I think the stunt people were used when things had to look authentic - motorbike riding and dancing - rather than the safety aspects. Completely agree. I was looking for doubling way more when I first saw TNA than the original series, and to this day I have problems coming up with many examples. 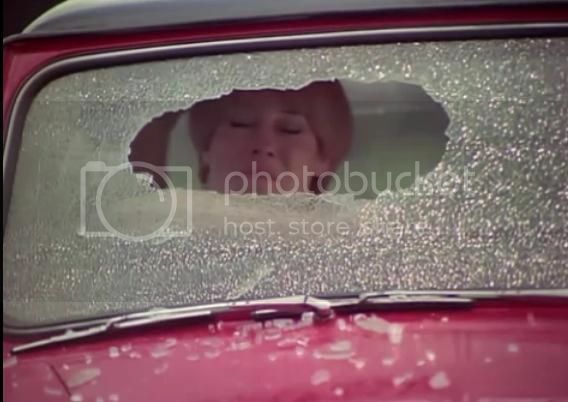 Some of them I know about more because they've been discussed in interviews rather than because I spotted them onscreen--Cyd when Purdey smashes out the windscreen in Sleeper for example. And Joanna riding her motorbike. The tap-dancing is pretty obviously not Joanna (she's confirmed it), and so is Purdey's first proper fight in The Eagle's Nest. But like you, those are the only ones that come to my mind. Gareth is even harder. I can only come with two instances--parts of his fight with Spence in House of Cards, and the long shots when he's getting the stuffing beaten out of him in Hostage. But most of the time it looks like Gareth. As you say, doubles were usually brought in out of necessity--they tried to get Joanna to learn both the dancing and the motorbike, but she just didn't pick it up in that half hour they gave her. There were probably more instances of doubling, but they're good enough likenesses that I never notice them. I think TNA beat the original in that respect. If they'd have ever imagined that the show would one day be recorded for home viewing or that we could watch the episodes with optimum clarity I'm sure they would have taken more care over the "doubles" (which has beome an ironic term). As it was, it was all an illusion that was over very quickly. As a kid I never even noticed, but then I never even saw the show in colour, just scratchy black and white until the repeats when Channel 4 started. I bet Honor and Patrick would have liked the luxury of being doubled for the fights but that would have been a huge headache for a videotaped series when a retake meant going back to the start of the episode and starting again - and at great cost I would imagine. I suspect they used them rarely due to the 'filmed live' approach, as previously suggested by others. A Chorus of Frogs has one of the extras double as the body in the mortuary, and Stephen Cory doubles for Alan Haywood is the scene where he's shot with the harpoon gun. Man in the Mirror has a double for the corpse. The Big Thinker has a hand double for Steed. Mandrake has doubles for Rev. Whyper and the sexton in the VTR insert. That's very interesting, Piers--I was wondering about this just a few weeks back, actually. Interestingly, they seemed to have used doubles more for things other than fights. I assume that doubles for hands and such were used to free up the actors to get into position within the tight time frames? Patrick Macnee's hand double--there's a job description for you. I'm sure there was a convenience factor in there as well--I assume there wasn't time to go around sourcing stunt doubles who closely resembled every single regular and guest star who would be involved in a fight. You had your regulars, and stuck with them. So there's probably more effort made to "match" people up nowadays. But some of the matches are so bad that I noticed them even when I wasn't looking for them. The videotaped series were lucky enough to be able to shoot the fight scenes ahead of time to be inserted into the "live" footage later on--I can't remember how many minutes a week they were allowed, but they pretty much always used them for fights. That could have let them use doubles, but they never seemed to. It might have just been too difficult to segue a double in and then do cuts of the actors' faces. What, more hand doubles; I just heard about Elizabeth Shepherd's hand doubling for Diana's in 'Town Of No Return'. There's no limit to what Trivia can be found! I'd forgotten that the fights were recorded first, and separate from the rest of the episode. I'm not technical with film against video but I'm sure there are things you can do with film you can't very easily on videotape. It might be something to do with a long angle shot or the editing or something like that, but whilst it may have been just about possible to get a stand in on video it'll have been a lot easier and simpler just to train the actor in the fundamentals of fighting on screen. It basically comes down to choreography after all. Watching The Guilded Cage recently I was reminded how the videotaped era look so 'stagey'. You are much more 'involved' as a viewer as you are in a theatre. It has a kind of intimacy the filmed episodes don't have. There's certainly more of a ''real time" thing going on as well. I suspect there were technical limitations to the videotape shooting process that made doubles hard to use. Plus they were always under a time-constraint, so doing the choreography was probably easiest, you're right. The videotape episodes are definitely more intimate, and theatrelike. Even the sound has this muffled, insulated quality. I always find you can feel the mild undercurrent of tension, too, as everyone's on their toes trying to make sure everything was running on time and properly. If they'd have afforded to VidFIRE the telerecordings it would've felt even more immediate, with 50 fields per second instead of the rate of about half that, it would've looked close to the original transmissions. Completely agree. I was looking for doubling way more when I first saw TNA than the original series, and to this day I have problems coming up with many examples. Some of them I know about more because they've been discussed in interviews rather than because I spotted them onscreen--Cyd when Purdey smashes out the windscreen in Sleeper for example. And Joanna riding her motorbike.